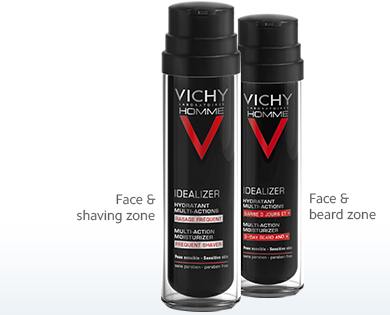 What it is: Vichy Homme Idealizer Multi-Action Moisturizer is a new cream for men that is available in two formulas: one for the burly bearded and one for the frequent shaver. The lotions, when used post-shave, work to instantly soothe irritation, moisturize, and reduce signs of aging and fatigue. What is most unique about this lotion is that it helps improve overall ease and effectiveness of the next day's shave for smooth skin, or helps to moisturize beard hair for those with more to, well, manscape. Beauty bonus: This lotion does not burn the skin when applied directly after shaving like most lotions. It has a subtle scent that won’t scare off even the most low-maintenance man. Beauty bummer: Guys, don’t expect an immediate visible decrease in signs of aging and fatigue. This lotion requires a few applications to truly improve skin’s overall condition — but when it kicks in, it really shows. Overall: This lightweight and refreshing aftershave lotion is a must for even the most demanding manscaper or bearded beauty.